Between the time you bring whole fish or filleted fish home from the market and eat it, store it properly in the refrigerator. Doing it right is not difficult, but it is best done with a little extra equipment. If you don't plan to eat the fish within a couple of days of purchase, freeze it. Keep the fish on ice—even in the refrigerator. It is no coincidence that fish is displayed on crushed ice in the markets. Fish rots quickly, even in the fridge, unless it is iced. Fish usually swim in water that is colder than air, sometimes a lot colder. They have evolved to survive in water that is just above freezing. Warm air increases the speed at which they spoil. The best method for storing fresh fish in the refrigerator requires a cooling rack that fits inside a large shallow container such as a roasting pan. The cooling rack should be a grid or mesh design with many openings. If the rack doesn't have legs, find a way to elevate it inside the large container. If you don't have a cooling rack, you can use another container, but punch several holes in it so the fish can drain. Take the fish out of the store packaging. Rinse it under cold water and use paper towels to dry the fish. Place the fish on the rack. Don't let the fish touch or overlap. Set the rack with fish inside the large container. Put crushed ice in the large container. Don't let the ice touch the fish on the rack. The ice level should fall just beneath the fish. Cover the container, rack, and fish with plastic wrap or aluminum foil. Seal it tightly and place it in the refrigerator. If you store the fish for more than one day in this manner, replace the ice as it melts and pours off the water. If you don't plan to eat the fish within a couple of days, freeze it instead. Remove the fish from the store packaging. Rinse it under cold water and use paper towels to dry it. Put the fish in freezer bags or containers. Label and date the bags or containers. Put in a freezer set at 0 degrees or colder. 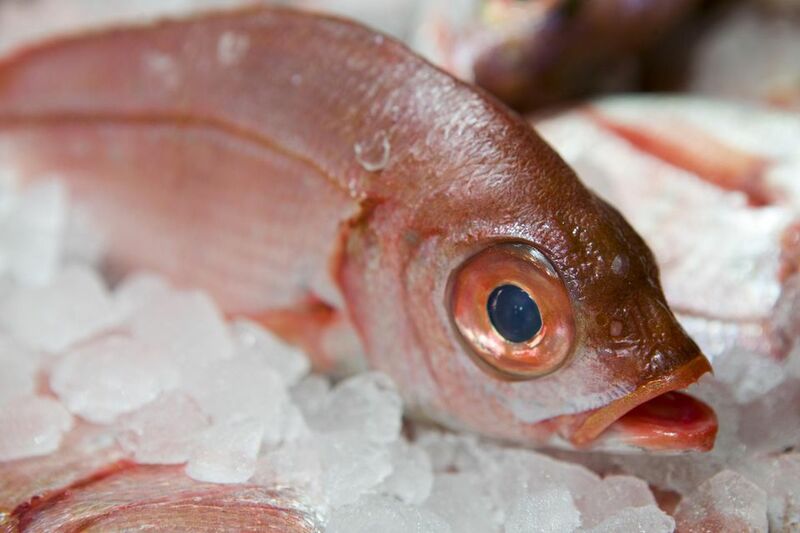 For the best taste and nutrition, thaw and prepare the fresh fish within two weeks. Thaw the fish in the coldest part of the refrigerator.